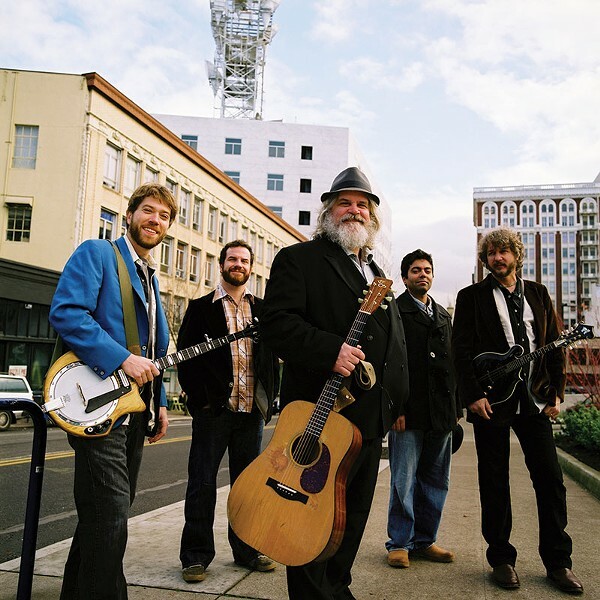 Leftover Salmon play Terrapin Crossroads March 26–27 at 8pm. $25. 100 Yacht Club Drive, San Rafael. 415.524.2773. SOMETHING FISHY Jam-grass pioneers Leftover Salmon turn 25 this year. Leftover Salmon didn't set out to be an influential trendsetter when they formed in Boulder, Colo., nearly a quarter century ago. "It's not like we positioned ourselves to be a jam band over a bluegrass band," says guitarist and band cofounder Vince Herman via telephone. "We were just guys from ski towns trying to make a living. We managed to come out with something; I'm not sure what the title is. We call it 'poly-ethnic Cajun slam-grass.'" Nor was the Leftover Salmon sound calculated to appeal to fans who followed the members' previous groups. "When we first started doing this people were like, 'Really, you guys play bluegrass with drums and electric instruments? Really? Who's going to like that?"' says fiddle and mandolin player Drew Emmitt, the band's other cofounder, in a separate phone interview. It turns out a whole lot of people like it. Formed in 1989, Leftover Salmon began expanding outside Colorado a few years later, developing an ever-growing legion of devoted followers who would turn up each time the band hit a town. They released their big-lable debut Euphoria in 1997. By 2005, when the band went on a five-year hiatus, they had a national following and inspired dozens of bands to follow in their footsteps. Last year, Leftover Salmon (which currently includes bassist Greg Garrison, drummer Jose Martinez and banjo player Andy Thorn) worried some fans when they announced their plans to cut back on bus tours, months-long sojourns across the country, in favor of shorter, more focused runs. "Our plan is definitely to cut back," Emmitt says. But he adds fans shouldn't be concerned about never seeing them; it just may be less often than in the past. So how did the band come up with its unforgettable, perhaps regrettable, name? As 1989 turned into 1990, Left Hand String Band, a bluegrass outfit led by Emmitt, joined forces with jug band the Salmon Heads, led by Herman, to play a Boulder-area New Year's Eve show. They needed a name quick, took parts from each band and— voilà—Leftover Salmon was born. They didn't expect the band or the name to last and had no clue that 24 years later they'd be hailed as the architects of jam-grass. "If we'd had any idea, we could have come up with a much better name," Herman says. "We thought it was going to be one gig when we started. Now we're stuck with it."